Battery-powered combo boasts Bluetooth functionality, separate mic and instrument channels. 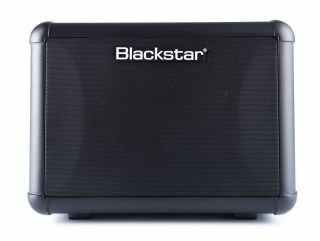 Blackstar has unveiled the new Super Fly, a 12-watt version of its popular FLY3 three-watt portable amp. In addition to the increased wattage, the new offering boasts separate microphone and instrument channels as well as Bluetooth functionality. The amp runs on eight AA batteries, or with an optional rechargeable battery pack which discreetly attaches to the back of the unit, providing over 15 hours of playing time. A 12-watt powered extension cabinet, which connects to the Super Fly and expands it to a 24-watt stereo rig, is also available. The Super Fly is being offered for $229.99.